On a still and humid Tuesday evening Simon and myself headed to Peak Scar in an attempt to avoid the midges. Instead of midges we found ourselves battling through a flourishing sea of nettles, but at least it was a pleasant temperature. Unfortunately the tree clearance a few years back has opened up more light and space for the nettles – dread to think what they are like at Whitestone Cliffe at the moment. 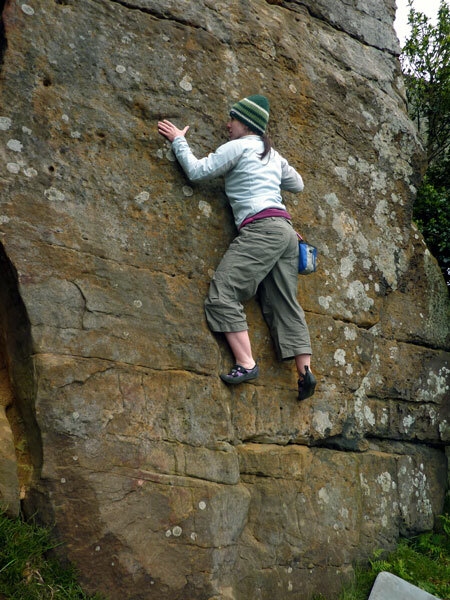 Having made it down to the far end of the crag with just a few stings, I decided to have a go at one of the new (2010) routes by Tony Marr and Mike Tooke – Solitude Direct MVS 4b. All in the name really – a direct take on Solitude. It does have some nice moves going over a small overhang – however the upper ledges are rather filthy – moved back left at the very end to finish at the same point as Solitude. I had heard some thrashing in the undergrowth whilst climbing the route, and when belaying at the top the culprits identified themselves – we were joined by Paul and Jamie who had taken an alternative approach via the far right of the crag, from where they had to fight their way through the last few metres of nettle forest, probably discovering a few new species on the way. They soon made it around the corner for Paul to lead Downbeat (VD). 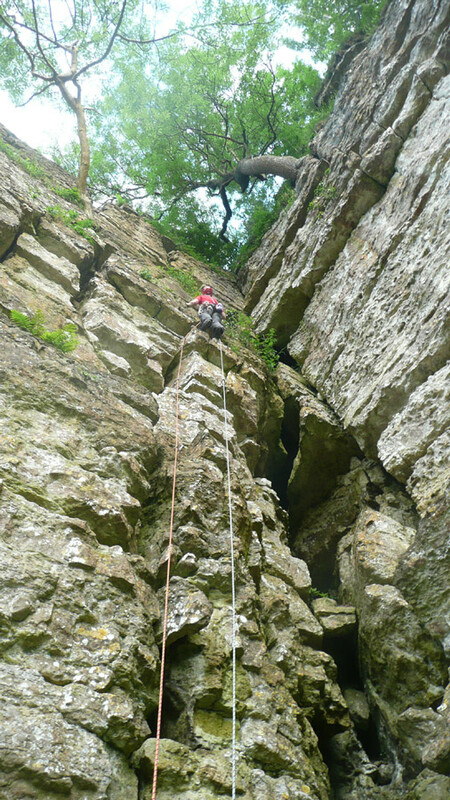 Meanwhile Simon took over the lead for a repeat ascent of Cobweb (VD) which goes up the outside of Murton's cave – a pleasant route apart from the muddy top-out. We then had a swap of places with Jamie (brimming with enthusiasm) leading Cobweb – which he admitted enjoying afterwards. I went around the corner and led Gone (HS 4b) which we had not done for a few years. 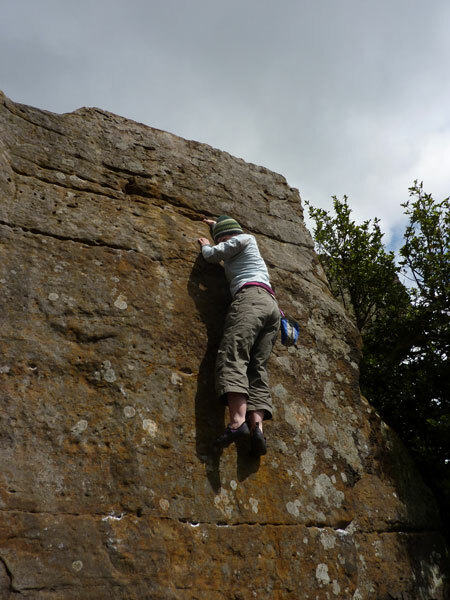 Steep but juggy climbing – didn't seem as loose as last time but not sure about the overall security of all those blocks! Fortunately they held and Simon was soon up to join me. We met the others at the top and retreated back to the car in the fading light. As if we didn't have enough already, Simon managed to bring a monster pet slug or snail back with him – with trail all around the boot of the car and over all the stuff dumped in the hall upon arrival. 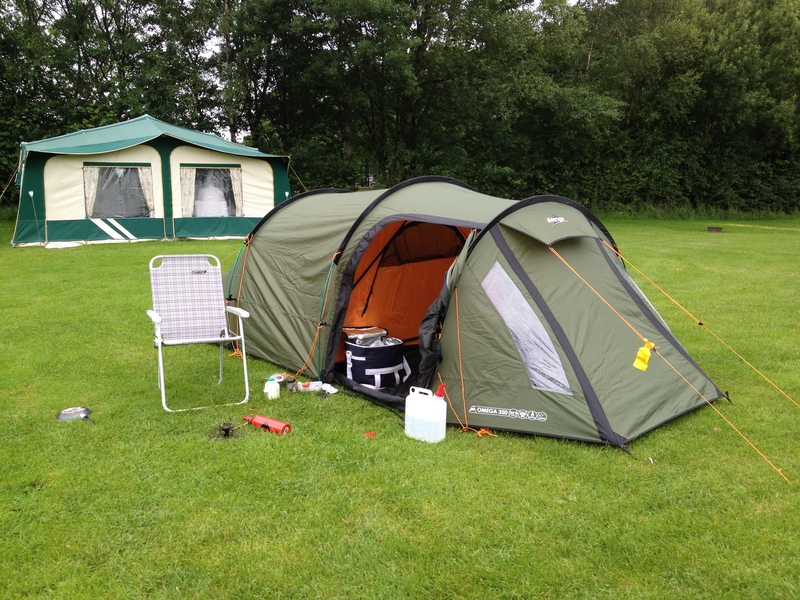 Given the weather this summer it was no surprise that only 6 people turned out for the July camping meet. It was almost 4 due to my last minute dithering about the weather forecast, but luckily we took the risk and met the others at the Fisherground Campsite at Eskdale Green. On Saturday Mike and Paul headed off for some mountain biking. They've obviously not been properly briefed on the club's biking ethics, as not only did they cycle for 27 miles rather than a walkable 27 km, they also failed to stop at any tea shops or pubs until after they'd got back. Ben and Kirsten did a walk up to Burnmoor Tarn Illgill Head at the top of the Wasdale Screes, pausing to watch a few hardy fell runners on the Wasdale fell race. Carmen and I meanwhile headed for some climbing on Great Gable, which we'd picked as most likely crag to have dried out. We started at Kern Knotts, and finished there too as the Napes, where we'd intended moving on to, were mostly in the cloud. Innominate Crack (VS 4b ***), Kern Knotts West Buttress (MVS 4b **), Central Climb south Face (MVS 4b *), and to finish, Kern Knotts Crack (VS 4c ***). Most of the hard pitches were led by Carmen who was on a roll, and followed by me, who wasn't. 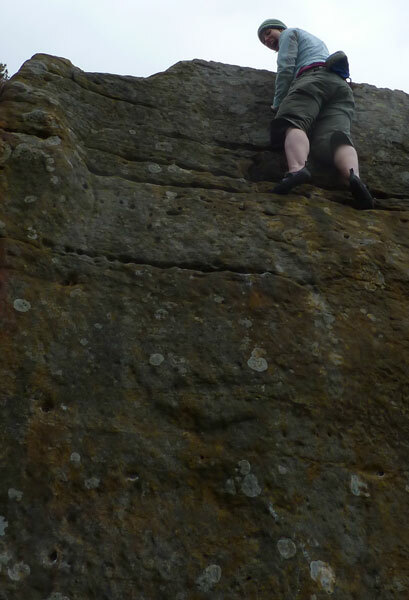 Kern Knotts Crack featured some hard 4c climbing a few feet above dodgy gear – top tip, take a no 5 Friend! Sunday once again started dry. Mike and Paul meant to do Scafell from Eskdale, but the view from the car park was of cloud, so they did a fine scramble up Harter Fell instead. Ben and Kirsten also headed for Scafell, but from Wasdale, and were treated to some fine summit views of the inside of a cloud. 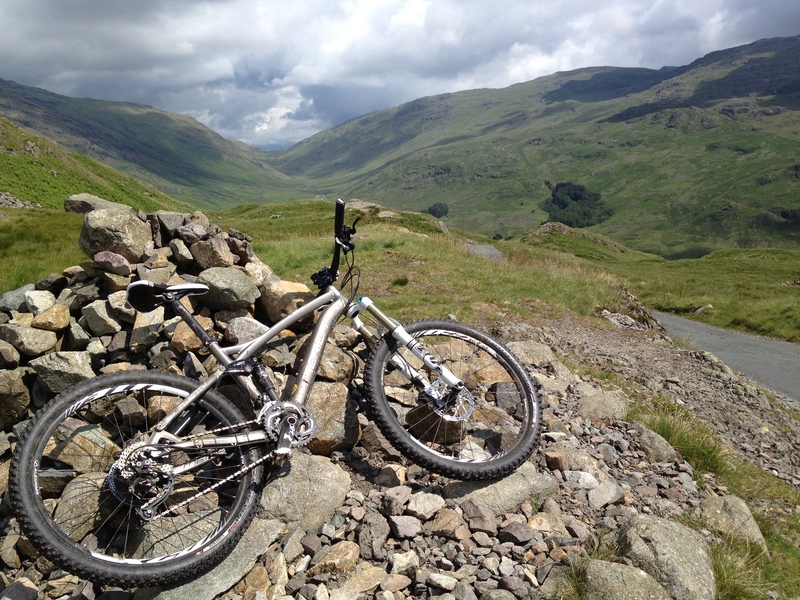 They persevered though and by the time they reached Scafell Pike, the cloud had lifted. Heavy rain arrived with perfect timing, 2 minutes after they reached the car. C and I decided against a return to the Napes as it was too windy, so did a few routes on Overbeck Crag, half way up Yewbarrow. Bowderdale Climb (MS*), Overbeck Buttress (MS*) and Central Chimney (S**) – some nice climbing, and the rock was mostly cleaner than it looked. Not a lot of gear though, except in the chimney, and all the routes we did were serious for the grade. Unfortunately the rain was less well timed for us, starting 10 minutes before we got back down, so we had a nice wet drive home. Thanks to Mike for organising an excellent weekend! You win some, you lose some. Yesterday me and rob set off for Pot Scar, and retreated after only one route – the one which finishes inside Elaines Cafe. No sooner had we distributed gear into sacs than the heavens opened and the Fifth Horseman of the Apocalypse, he who is called Really Heavy Rain, came thundering forth. And lo! the people did retreat hastily to the wall which is called Harrogate. That evening I cast the runes, sacrified a goat, examined the entrails of a chicken (which seems about as reliable a method as reading the weather forecast) and determined that the weather gods had decided East was best. So late on sunday morning Dee, Dave Shield and me headed for Scugdale. Several unbelievers defied the gods and headed for Almscliff instead, wrathful deities hurled gales at them and they too fled to the Wall of Harrogate. 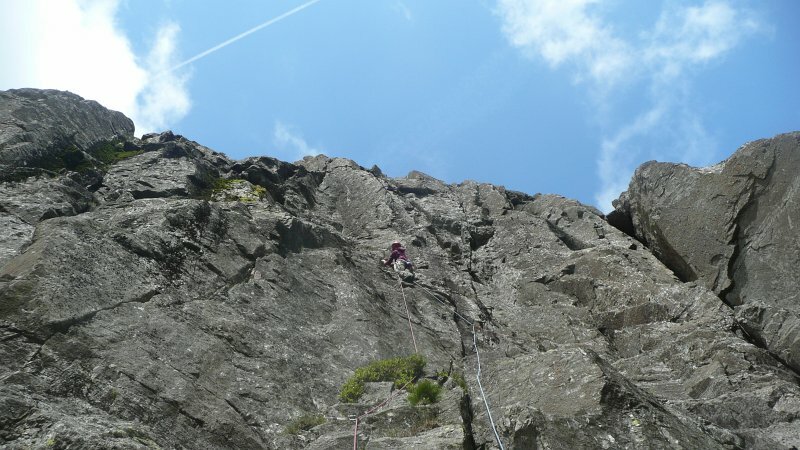 Meanwhile the righteous enjoyed a fine afternoon soloing short routes on Scot Crags. 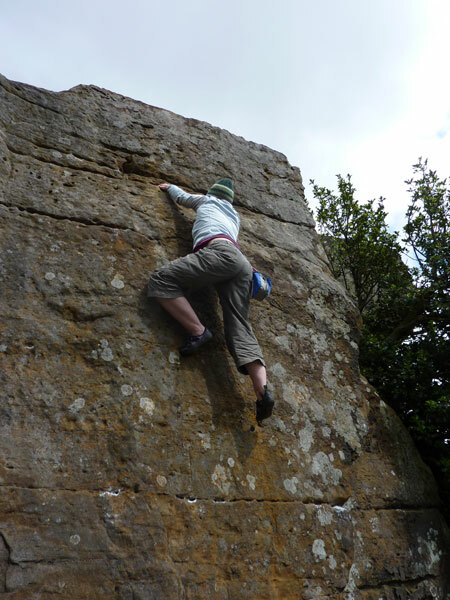 Dee did really well, having only been bouldering/climbing outside a few times before she succeeded in topping out on the classic Pingers (VS 5a) in fine style. The weather was still quite blowy, a bit disconcerting on balancy stuff but nothing unmanageable as we were sheltered from the worst of it by the crag, and the forecast occassional light showers came to no more than the odd slight spit. We even had some sunshine! Below: Dee throwing shapes on Pingers. 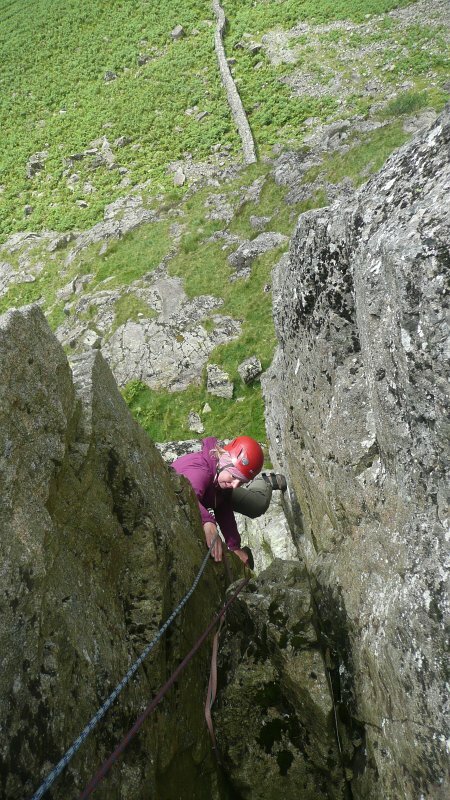 You are currently browsing the York Alpine Club Blog blog archives for July, 2012.